Equation (6.17) in EN 1998-1 allows computation of Vp link taking into account the interaction of shear with axial force, while equation (6.18) in EN 1998-1 allows computation of Mp link taking into account the interaction of bending with axial force. The local plastic mechanism in seismic links depends on the topology of the structure. 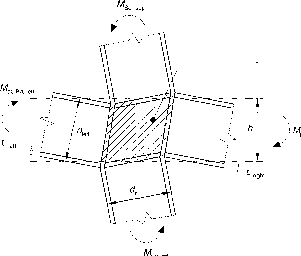 The topology of a structure can be such that bending moment diagrams in the link are symmetric (Fig. 6.16) or unsymmetric (Fig. 6.15). The plastic mechanism in seismic links also depends on their length, e. Short links yield essentially in shear; the energy dissipated in the plastic mechanism is Wv = Vp iink(9pe. Long links yield essentially in bending; in a long link subjected to the symmetrical action effect M as in Fig. 6.16, the energy dissipated in the plastic mechanism is WM = 2Mp link6>p. Between these two values, es and eL, links are termed 'intermediate', and the interaction between shear and bending has to be considered by making use of equations (6.17) to (6.20) in EN 1998-1.